With Summer seemingly hurtling by faster than a speeding bullet, it won't be long until we're bombarded with a new season's worth of TV shows hoping to grab our attention and secure an audience. 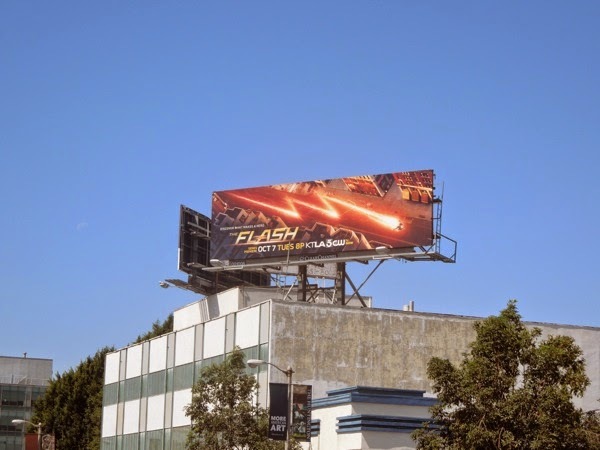 Fortunately some shows have more of an advantage than others, like The CW's new spin-off series from Arrow, which will star DC Comics popular Justice League member, 'The Flash'. The speedster hero has already appeared in his civilian guise in the second season of Arrow, with 'Barry Allen' played by Grant Gustin of Glee fame, when he was struck by lightning and placed in a coma following an accident at S.T.A.R. Labs. 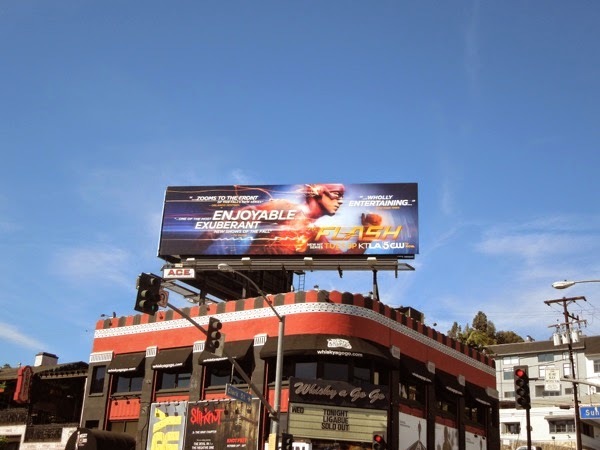 Obviously in his new show the ultrafast superhero will be waking up to fight crime, although it's not the first time his iconic red costume has appeared in its own television series, as John Wesley Shipp played the titular hero in his own 90's show which ran for one season but was cancelled due to high episodic production costs and stiff time slot competition. 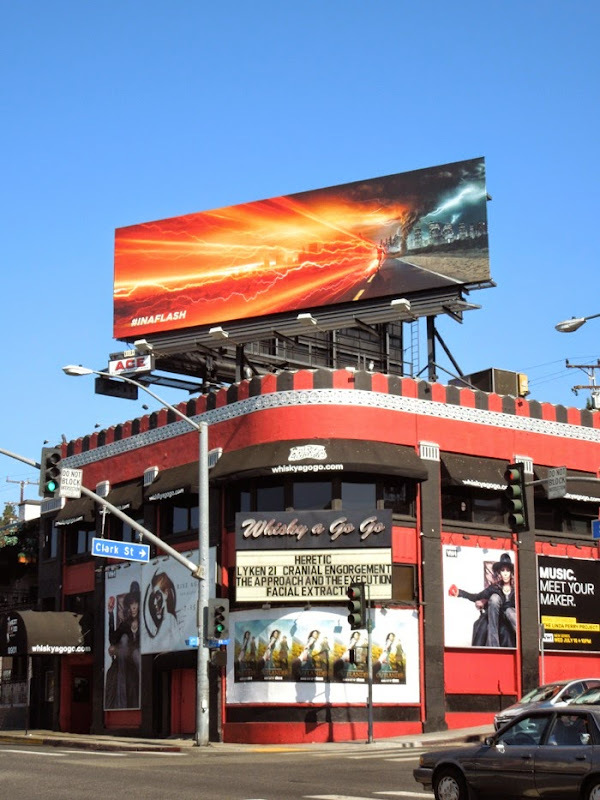 This electrifying 'In a Flash' teaser, snapped over the Sunset Strip's infamous Whisky A Go-Go club on July 30, 2014, is the brilliant burst of colour the city skyline needs this Summer, which is like no other outdoor ad at the moment. 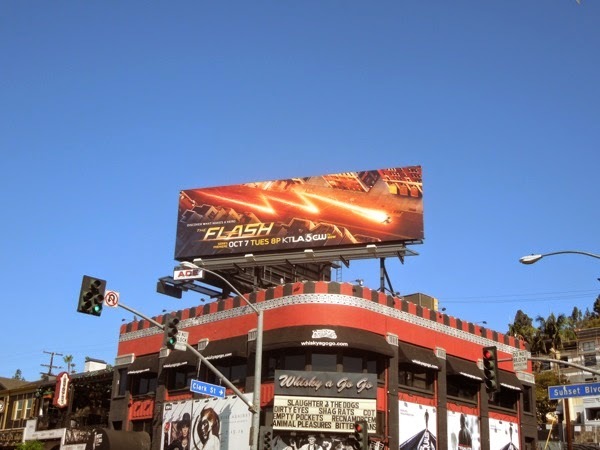 Hopefully Flash fans will be excited by this cool imagery and Daily Billboard is sure more surprises will follow to help launch the new superhuman show. 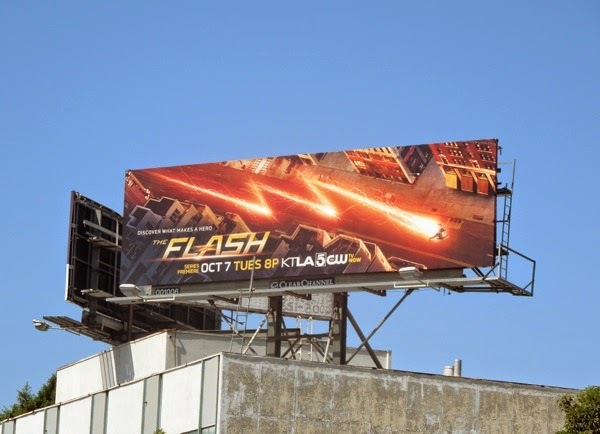 If you're a DC Comics fan, be sure to also check out how they kickstarted the 'Green Arrow' on the small screen two years ago with these fun billboards for Arrow starring Stephen Amell. 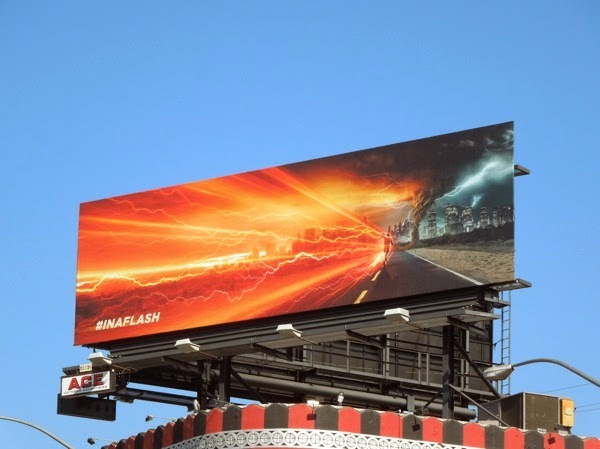 Plus for more DC Comics heroes on the big screen, take a look at these Man of Steel movie billboards, Green Lantern film billboards and The Dark Knight movie billboards. 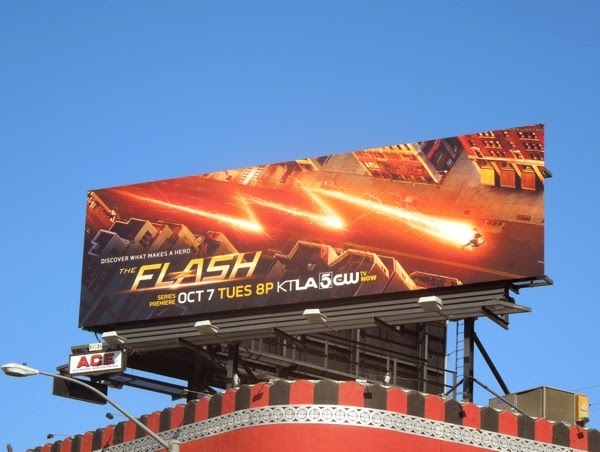 UPDATED: Like a lightning bolt from the blue, replacing the electrifying teaser ad along L.A.'s Sunset Strip on September 11, 2014, here's the official series premiere billboard for The Flash. 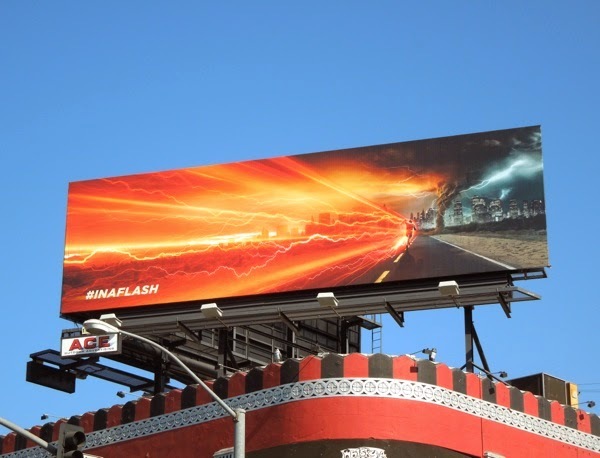 It's a shame this new comic book show from The CW doesn't have a bigger outdoor advertising budget as they really could have done some spectacular special effects billboards for the launch of this series. 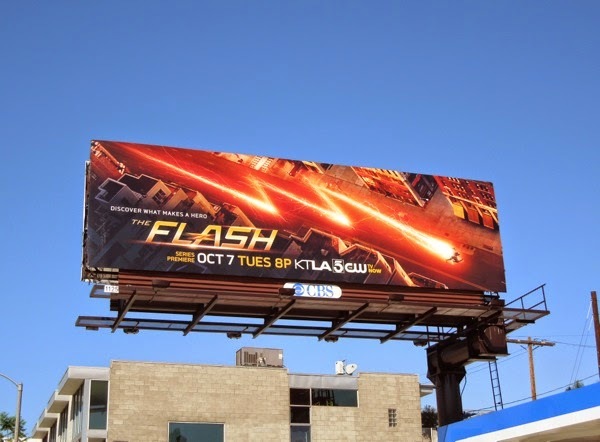 Ah well, they probably saved their cash for the speedy superhero effects on the show itself. 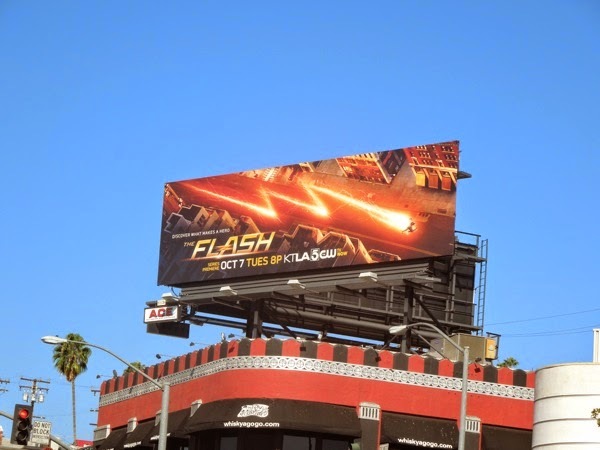 UPDATED: Here's another billboard for The Flash spied high above Beverly Boulevard on September 15, 2014. 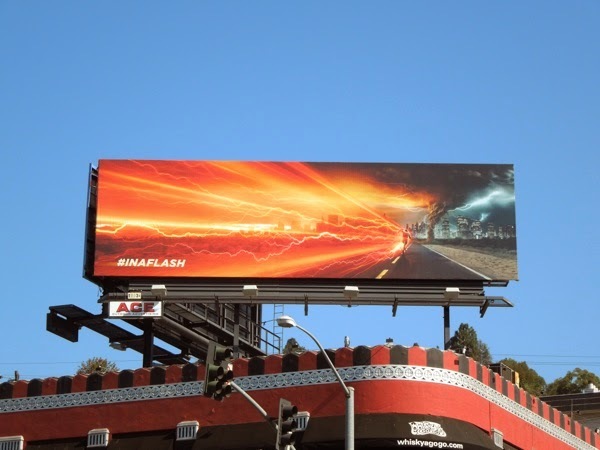 The speedster's signature lighting bolt really makes for a great visual from afar to draw you in. 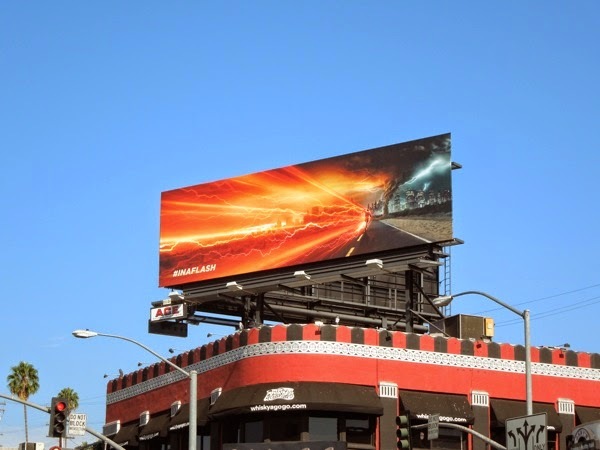 Plus another ad spotted along Melrose Avenue, looking amazing against that California blue sky. 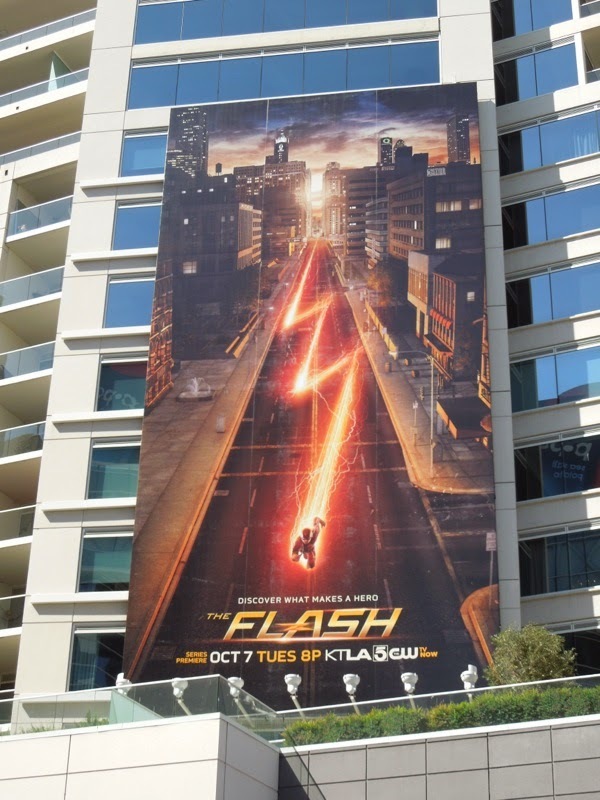 UPDATED: Here's a different portrait ad creative with The Flash zigzagging down the streets of Central City, allowing us to get a slightly better look at Grant Gustin as the scarlet speedster. 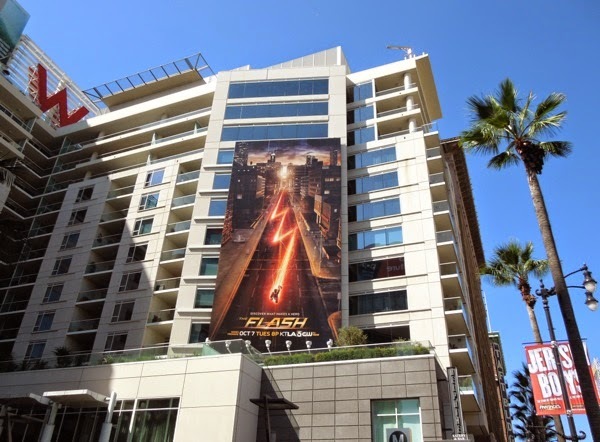 This cool vertical billboard for the rookie superhero show was snapped at the W Hotel in Hollywood on September 18, 2014. 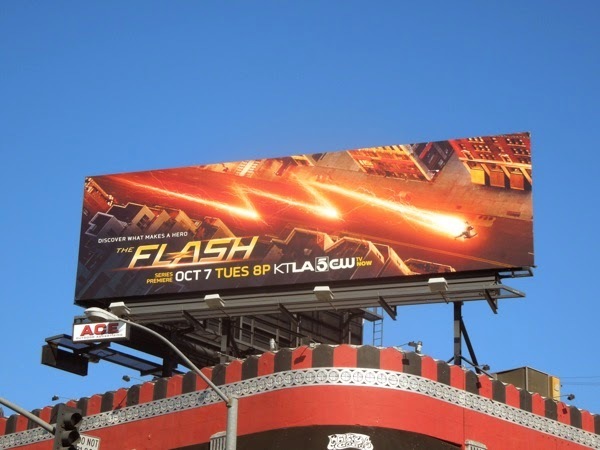 UPDATED: From the looks of things The Flash is fast becoming a Fall season favourite and has already received a full season order from The CW. 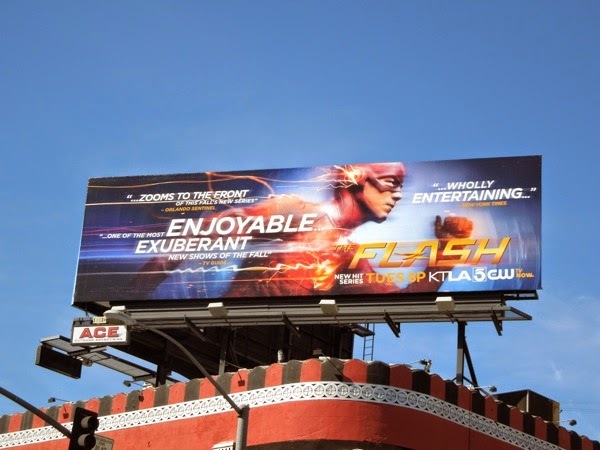 To mark the occasion here's a review themed billboard for the freshman superhero series, with critics having lots of good things to say, spied along the Sunset Strip on October 22, 2014. 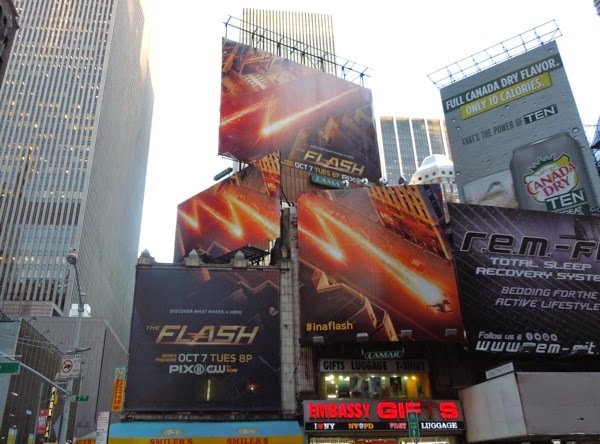 UPDATED: Here's also a collection of cool billboards showing the superhero streaking along 7th Avenue near Times Square in New York City on November 3, 2014.